The team is in Wells, where objects under scrutiny include a bracelet once gifted by Queen Victoria, and there is a revealing moment for the owners of a rare tapestry. Browse content similar to Wells. Check below for episodes and series from the same categories and more! the clamour of the crowds there's an inner silence. before they let loose on some fine object put before them. There were lots of those here when our charabanc arrived in Somerset. of great finds from Wells. tell us a little something about how we live today. And all of that applies to where we find ourselves now. given that work was begun on it almost 800 years ago. Inside is no less impressive. Engineers today are awestruck by the brilliance of 14th-century thinking. thought to be a cure for toothache. which is why it's so worn here. the skeleton of the bishop perfectly preserved and every tooth intact. so they weren't taking any chances. to the gardens of the Bishop's Palace. but tell me, why have you got the bowl? I'm the niece of the original artist. the original painting to go with it. and this is a drawing by Barbara Vernon Bailey for that bowl. and to everybody's amazement it took off. -And has gone on and gone on and gone on. What was she like? because she painted rabbits she was gentle and soft. Very strict and everyone was terrified of her. -So, this is very unlike her, really? -We all knew her as Babs. Completely alien to the person I know. who is a nun who designs rabbit tableware and you've answered. -Not, not who you assume. and early versions and all that sort of collector stuff. -Is this the only drawing you've got? -No, I do have one other drawing. -And again related to a piece. -Yes, I mean I have about 60 pieces. So, lovely drawing, there's the bowl, what's the drawing worth? -No idea, they're pretty rare. for one with a provenance like yours. -It couldn't be better, straight out of the family. Out of the nuns' lair, as you might say, out of the convent. Actually, on the back, it says Christmas present. and the question is, is this an original drawing by Renoir? -It came into the family through an uncle who was a dealer, really. With a very, very good eye. -Did he have very good pictures? A lot of modern things too which was interesting, Bacon, for example. -So he had a roving eye, you might say. A very, very roving eye, absolutely. -But very, very high quality. Most of his collection is now in museums. Well, then we've got to take this object very seriously indeed. with the frame and everything... what a pretty thing it is. And it's just been part of the fabric of wherever we've lived. But you've never asked the question, "Is it a print or a drawing?" We've always been led to believe it's a print, we never queried it. and who knows where you stop after that? this is the thing, isn't it? involve taking it out of the frame, so we've got to start with that. Put the frame down here. and, er, if we look there, there's a sort of blind stamp there. is that a collector's mark or a publisher's mark? What do you mean by a blind stamp? -and then stamped onto the paper. when they're pushed through the paper, so that's the first clue. in a raking light, at a very, very slanting light. what you're looking for is a change in the sheen that you can see. There should be a mattness where the crayon is. and it leaves the wire marks as a slightly thinner area in the paper. lines from the laid paper that it was drawn on. with the laid paper lines of this paper. and the same here, and the same here. I'm afraid it's a clincher, it's a print. -There's no way round that. It would have been too amazing for it to have been anything else. -We never thought that it was anything else. But it's great to have asked the question. As a decorative object in that frame, it's absolutely lovely. -And its provenance is special to us. A couple of hundred pounds is the most I could really put on it. "supplied for the funeral of Lord Nelson,"
-and it's signed, Rosa J Atkins. to my grandfather, so it's been in our family for three generations. was transferred into at the time, who knows? -It's one of those things lost to history. were taken out of the vats that they made it illegal. -in London at the time. it is truly, truly wonderful. and the date of manufacture would be around about 1800. A very well-known London maker, and of course the grips are ivory. -Would it have been a dress sword? -No, no, it's a fighting sword. they are purely for show. They're not. -This is a fighting sword. I would value this sword at somewhere between 6 and £8,000. in the lovely autumn sunlight, tell me all about them. from the Scottish point of view, was rather, not so good, really. -And defeated Bonnie Prince Charlie in 1746.
in the United Kingdom. It was hideous, wasn't it? -was killed by the Highlanders. of Butcher Cumberland due the way he pursued and murdered the Scots. Went with Cumberland and did the dirty work, as it were. My goodness. What a terrifying story. but the bracelet is 19th century. his head is too far up in the, sort of, composition. and he was very strongly establishment. Yes, I see, strong establishment. and he was showing his loyalty to the Crown. My goodness! That's certainly evident from that. -And that would have been worn by his wife. -and certainly not an 18th-century one. fascinating connections in the form of this one. -Tell me, tell me about that. lady of the bedchamber and lady-in-waiting. And, and clearly it is a memento of great affection, isn't it? she was 30 years a widow, wasn't she? so if you had a bracelet from her, it was rather a good thing to have. -when she received that, don't you think? -I should think so, yes! -she used to run alongside the carriage. A sort of marathon lady-in-waiting! -because she's got a tiny wrist. This one here is of great historical interest, maybe 6, £700 for that. and I'm thrilled with them, thanks so much, brilliant. Wonderful. in the run-up to the Second World War and during the war. You started off as a debutante in the run-up to the war, didn't you? In fact, we've got a picture of you here. Tell me about this. -By the way, do call me Christian. -Christian, I will, thank you. oh, just over weeks, I was in an absolutely horrible factory. making rivets for Halifax bombers. Why did you decide to do that? "why don't you see if you can get a job in an aeroplane factory?" And then we both looked at each other. who was a bit surprised, but anyway, within a week I had a job there. And your job was doing what? I have this one is that I made that hole crooked, so it wasn't any good. Of course, because it would have to be absolutely precise. -I can see, it's gone in at an angle there. the leading edge of Halifax bombers all along there. who flew the planes for which you made these? -These key, small-but-essential bits of metal. "Please, I want to meet somebody who flew Halifaxes,"
I'm looking, this is someone from the Royal Canadian Air Force there. DFC here, so recognised, yes, with a medal. -I hope. We certainly did. hearing your story, thank you so much. -and it's clearly a 20th-century key cupboard. And you fell in love with it. Why? What was the thing? Nothing to do with keys. I found this in a antique shop in West London. -I opened the door and realised what it was. is down here which is, "Miss Naomi McGore's jewel case,"
and I just was enchanted. Did you know of the family when you bought it? -Right, and how did you track it down? -had the name McGore on them. -And really I wanted to find where the key case came from. -Because obviously it belongs to a house. -lived in Horsham in West Sussex. -It is called Forest Grange. -And does it still exist? -That's remarkable, isn't it? Let's look at the object itself. so they were obviously very advanced, technically. and so on, then they had a cricket pitch as well, didn't they? -Where did I see the cricket pitch? with its own lock, so they were obviously very wealthy. If we look here, we see this colour-coded chart. -Now Bramah keys were actually very advanced in their time. -although this is obviously much later. With one key, you could open every single lock in the house. relevant to their job in the house. It fits everything all the way down. -until we get to outside things. so many of the male staff of this house were killed. gone to the trenches, and how many of them came back? -..that simply wasn't going to reappear after the war. That, to me, is an indication of how much you loved it. -I did, I fell in love with it. It's gone up a little bit, but in real terms, not a great deal. -Let's say £500 in round figures. -Oh, right, that surprises me. -Well, I think it slightly has. -It's not the money, like you say. -this being one of them. -And it was down to a device called a magic lantern. And these are some of the slides that went with the magic lantern. Now, tell me a little bit about what we have here. there were some initials, here we go, WMS. That's my grandfather's name, William Martin Smith. And what was his profession? He was a public wharfinger. Nobody knows what a public wharfinger is. he had one of those big warehouses the barges came up to. so this was part of the entertainment and education of the children. -And, of course, then the slides to go with them. Now the slides came in various types, didn't they? are ones that don't move. it looks like all sorts of high jinks. Sort of Guy Fawkes night. It certainly looks as if there's some sort of party going on there. procession to the House Of Lords. The Queen Going To The House Of Lords, fabulous. Have you ever seen a magic lantern show itself? -and my father used to show these slides. Well, now, this one, I rather like. Showing the curvature of the Earth. just as we feel today, on top of the world, don't we? as it comes up over the surface of the Earth. -about £150, which is good news. we're getting on for perhaps between 800 and £1,000 on a good day. -I'm very pleased I came! by finishing on this one, off you go. and above I use it as a china display cabinet. -a display cabinet. It's a very feminine piece of furniture. It's absolutely tremendous, it's got slightly odd proportions. but the eye is taken by the painting across the frieze which is lovely. but this must have been made for a woman, do you think? Yes, I was thinking maybe Lady Hamilton or something like that. -I think exactly the period you were saying, of Lady Hamilton. you might need to help me. Oh, it goes back very easily. but in fact this slides out so you can get your knees underneath it. so everything for the, the blue stocking, in a way. an absolutely splendid piece, so where could it have been made? erm... Or one of the centres out of London. -but I don't think you're ever going to know for sure. Now, is this a family piece, or how did you come to get...? and I think she got it at very reasonable prices. about £5,000 if you were to try and sell it. So, it's such a decorative piece. Well, I...I really love it. -And Lady Hamilton stays in the mind! -Why did you bring me a toast rack? "I'll take it," never dreaming that you'd think enough of it to show it. I think it's wonderful, what do you think it is? -we had a sort of revival of this brown, didn't we? it reminded me of like the Doulton Harvest jugs. so I was disappointed, but it was £6. but it is salt-glazed stoneware. -So, where else was salt-glazed stoneware made? It was made in Derby, it was made in Bristol, it was made in Nottingham. I'm going to go for Nottingham. -That sort of soft colour that you get in the Nottingham ones. Doulton is often much darker, but it's the same material. I think this is about 1840s, 1850s. a salt-glazed stoneware toast rack. salt-glazed stoneware toast racks. And it is immaculate. -I know, I couldn't believe it myself. So, £6 in a charity shop. -Yes, a lot of money. but it's not a lot for a very, very rare salt-glazed stoneware one. especially with these frames and these lovely swags here. Now, are they your family? her mother and down the family. -And do you know all the names of the sitters on here? beautifully observed pastels, look at that. -and I see, on the back of one, it's got James Sharples. and, of course, portrait painters went where the money was. -for a pastel portrait painter. -Yes, at that time, yeah. -that sort of date. Would that tie in with what you know? My grandfather wrote notes on the back, and he's around, circa 1800. So is this how you hang them at home? I've got a picture here. is that James Staples worked in America and in England. er, it would add value because of the American connection. I would have said 4 to 6, 5 to £700. -even though she's quite fearsome, it's beautifully done. -two, three, four, you've got about £6,000-worth there. "British and Foreign Anti-Slavery Society." -How did it come to you? beautiful table, she's still got it. That was in the drawer. -A complete surprise that it was there. for the last 50 years. That's carnelian I believe. Yeah, carnelian just like my ring, which is also a cameo. Hm, and I presume that's silver. It's a beautiful thing, and let's see whether it works. that it doesn't hang on. Well, it's better than nothing, isn't it? Actually, it shows you just how finely carved that is. and the detail, the perspective of the figure is some tribute. Now, this is an image I recognise from my ceramics background. -Well, rather like, you know, modern political badge. they didn't succeed in getting slavery abolished until, what, 1833? -Which is a whole 50-something years later. Yes, I sort of guessed it was prior to 1830.
a lot more than your average cameo. Well, let's say, £1,500 to £2,000. Better than a wad of notes, though, isn't it? Well, the value is meaningless really because it'll go back in the drawer. and see what was going on at the back? -I mean, how long had you had it in the family for? -You've known it all your life. -And my father's as well. So it's been in the family for a long time. -A long time, and it's been in this case. with the name "Roberts". Does that mean anything to you? -That's it, and that, that's your maiden name. -So let's just take this away. I'll put the paper over here. Look at that! Is that green baize? Gosh. -Do you see how you've got this line where the colour is different? -Yes, oh, I know what... Yes. -It's a stand, isn't it? -It's been on a wall for so many years. it was for... It's a lady's toilet mirror. -Well, let's look at the front and see what we can see there. Incredibly heavy! Oh, the dust of ages in here! That's great, thank you, marvellous. -And we'll just put it on the easel. This is a grand piece. This is what we call stump work. underneath the embroidery to raise it up off its background. you stuff the face, and then she has the three-dimensional effect. Now, what do you think these leaves are? -We guessed at silver or gold? -Gold leaf that's gone black, is it? Absolutely right, it's silver thread which has tarnished to the black. when this was freshly sewn, the vibrancy? -Must have been absolutely terrific. and what about the tortoise-shell frame? through Holland, from the Dutch colonies. so in the candlelight, this would have all scintillated and sparkled. It's a sign of immensely expensive, good-quality piece of workmanship. Well, where on earth does one start to put a price on it? would be prepared to pay somewhere between £5,000 and £7,000 for it. It was worth coming back to Wells for a second helping. Glorious objects, and the weather wasn't bad either. Thanks to the Bishop for letting us camp out in his wonderful gardens. 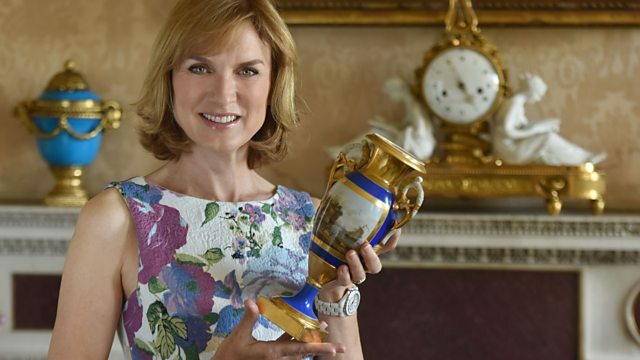 Fiona Bruce and the team of experts return to Wells in Somerset, where they welcome visitors with their valuables. Objects under scrutiny include a valuable bracelet once gifted by Queen Victoria and a small seal used by campaigners for the abolition of slavery, and there is a revealing moment for the owners of a rare tapestry.